We now live in a world where news spreads at the speed of Twitter and connections are measured in fans, likes, +1s, and followers. Social media and the potential digital audience represent a vast new frontier for science communication. Some pioneers have paved the way, but many others are still wondering: How do I communicate science in an online format? How can this benefit my career as a science communicator? How do I avoid the pitfalls that leave so many discouraged? Communicating science online is no longer an option; it’s a requirement. Science and science journalism are changing to meet the demands of an increasingly digital audience. 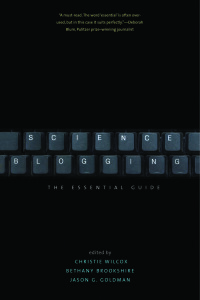 In Science Blogging: The Essential Guide (Yale University Press, 2016), we draw on the shared experiences of our editors and chapter contributors to create a comprehensive guide to science communication within today’s social media ecosystem. This book would not be possible without the generous support of the Alfred P. Sloan Foundation and the National Association of Science Writers. Thanks especially to NASW’s Idea Grant Committee for their thoughtful feedback on our proposal, for helping us to ensure this volume was as comprehensive as possible, and for helping us to ensure we could adequately compensate all our contributors. Their help allowed us to assemble the best possible roster of chapter writers, and we are grateful for their support. The Science Blogging pages are an editorially independent project hosted by The Open Notebook.